Are you wondering how to increase the sales of your burgers? 45% of Americans declare that they will order more food online in the upcoming 12 months. (source) Launch an online burger ordering system and earn more through selling your burgers online. This way, you can implement restaurant ordering system software on your restaurant website. 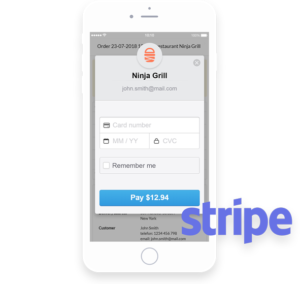 Customers will be able to make online orders in a simple way. Your restaurant will be available online, which is where your customers are looking these days for restaurants where they can order food. This way you can provide more food delivery services. 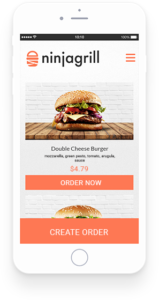 An online burger ordering system will increase your profits. Together with the online food ordering system for restaurants you can launch a mobile application that will be a completely new sales channel. 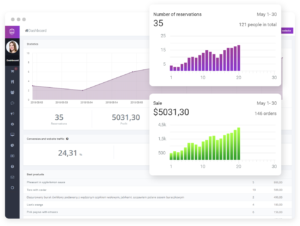 This way, you can increase the number of orders submitted to your restaurant even more. At the same time, a restaurant mobile app will be a tool to help you build loyalty for your restaurant among your customers. They will have it handy in their smartphones so, whenever they feel hungry, your restaurant will be their first choice. Do you want more orders? It’s very simple! Launch a Facebook ordering system and let your customers place orders without even having to leave their social media! The more orders you process, the bigger the profits you obtain. 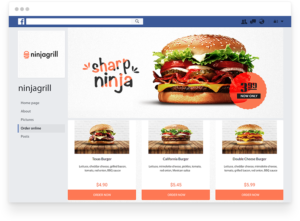 Read more about this in our article entitled: Facebook food ordering system. An online food ordering system for restaurants provides a completely new quality of collecting orders. Forget about a busy line during rush hours or mistakes when recording order details. The UpMenu system makes it possible to collect an order with just one click. The time saved can be used by your team to provide better services to your customers in the restaurant. 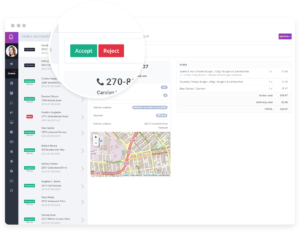 The restaurant ordering system software will make quick changes possible and simple in the scope of your deliveries and menu. You don’t need technical support or complicated IT skills for this purpose. Just a few clicks are enough to introduce changes. 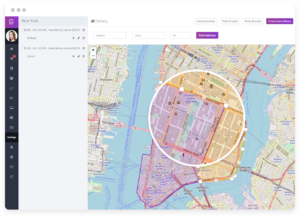 You can adjust the menu and delivery zones quickly and easily in the online burger ordering system. All changes will be visible immediately on the restaurant website and in the mobile application. More than half of all bills are paid online. (source) Let your customers pay this way too! The convenience of such a solution will translate into increased order numbers and profits. Don’t lose customers who don’t carry cash. Let them pay online. The online burger ordering system can be launched without help of IT specialists. This way you save time and money. The implementation itself is quick and easy. An online food ordering system for restaurants can be launched in just a few minutes. 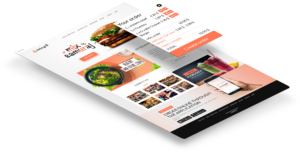 If you need a restaurant website, take advantage of the restaurant website theme store and match a template with your restaurant’s brand. Make the right business decisions thanks to the reports that your online food ordering system for restaurants generates automatically. Check which positions in the menu are the least profitable, and when the customers order the most frequently. Plan the work at your restaurant using reports from the UpMenu system. Save money and earn more. 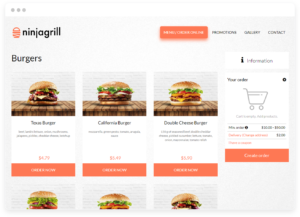 The restaurant ordering system software will increase sales of your burgers. Sell online and gain new customers. Don’t let your competition get past you! You can be sure others already use an online burger ordering system. This way, you can gain new customers while the additional features of the UpMenu system will help you in building the loyalty of your customers.